My new camera and tripod arrived yesterday so I am playing with it and figuring it out. This is a tripod shot from my mother-in-law's deck last evening. During this morning's walk I tried out the "face recognition" feature and by golly, it recognized me!! This "feature" allows me to walk out into the scene, turn around or sit down, face the camera and when it recognizes a face in the image it takes the photo. Sort of a timer thingy. I must admit this image is more interesting. And I tried out a manual setting to get some time lag and streaky tail lights. Quite foggy this morning but hey! It is starting to get lighter for my early morning walks. It was 7:15 AM when I took this image. Meanwhile, in the oddity department.... Evidently this guy hasn't gotten a "round tuit". this photo standing is the same location by only turning ninety degrees!! Starbucks are all over the place although I hear they are closing down some of them. And here is the "bulk" section of PCC. I see they have wild honey in bulk and when my current batch is used up I will be getting some. I also get my organic oatmeal here. I'm not a shopper but I gotta tell you, this place has really caught my attention. I sure hope they can weather the economic downturn. Thursday is trash pick-up day in this section of Shoreline and this truck and I were progressing along 3rd avenue at about the same speed. I stopped and made a movie of the operation. On the final leg of my morning walk I spotted this container ship heading towards Elliott Bay. And this front page photograph in the Seattle Times. My mother-in-law passed her lung exam at the University of Washington in fine style. "See you in six months!" said the doc. I had been rather apprehensive about this visit because I had never been to this facility before. But between directions from my wife, suggestions by my brother and fine tuning by "mom", we got there on time in spite of the traffic and congestion, it was a piece of cake! Speaking of cake. The VA called and told me the tissue samples from my thyroid are benign!! A total of two miles. She is 76 years old and has been doing this walk for 35 years!! I took this photo this morning as a gas price reference. And this shot of me coming down the 121 stairs! You may be happy to know I have ordered a tripod and a camera with a higher ISO! I happened to spot this out my mother-in-law's window yesterday morning. It looks like a huge portable container crane of some sort heading south on Puget Sound. Little feet and big foot! Actually Dark Eyed Junco's and one of my Crocks! sky lights on the roof of Costco? How nice. One stop shopping! Twenty three degrees this morning during my morning walk but a real sparkler coming on. Just like the prairie Indians had many names for wind, Seattle-ites have various names for snow and today's offering is call "flurries"; a bit more than a "dusting" but not really enough for a serious snowman. I walked over to Fred Myer and Deseret Second Hand on Aurora for a four and a half mile round trip exploration this morning. I discovered Fred Myer opens at 7:00 AM and Deseret isn't open on Sundays at all and 10:00 AM on week days. Fred Myers has some items I will need for my mother-in-law on occasion and the Deseret has a great selection of used books! Along the way I was intrigued by this reflection of the Highland Ice Arena's neon sign. I spotted this lost glove with a "dusting" of snow on it and thought about the story Phreerunner posted about "Bluey" the lost and found glove beside the Burma Road. Here is the homeless encampment on the grounds of the Calvin Presbyterian Church under a "dusting" of snow. And finally, back home to my mother-in-laws house which she and her husband built in the 40's. Many real estate people knocked on her door in recent years wanting to buy and subdivide her large lot but those days are over. But first let me show you the view from the living room last evening! Okay. Now then. During my morning walk to Edmonds and back I discovered my first "Oddity" since I have been here! See it? The storm drain grate got rotated when they replaced it after a storm drain cleaning. See the remnant fog stripe on the far side? Cool! Downtown Edmonds. They have "quaint-ed" it up and done a nice job of it. Edmonds graffiti artists seem to have more artistic ability than our fumblers in Fort Bragg. Jeez! Even the clock is wrong! Okay Elaine, here is my rebuttal to your manzaneta skin blog. Elaine found a beauty shop with perm drying chairs even more cool than the ones I discovered in my mother-in-law's beauty parlor. They even had ash-trays in the arm rests!! So this photo is an attempt at "pay-back" although this might be a madrone. Returning home just the peak of the Olympics was sticking up above the fog. Why do I start my walk at six in the morning? Because the traffic is almost non existent. By 7:00 AM it is a different story. Folks waiting for the bus. 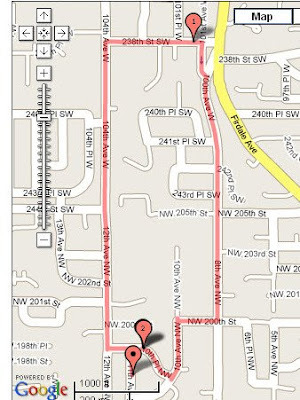 I plan to start using the bus to get to some interesting walking areas like Fremont and Greenwood one of these days. They are too far away to walk to, round trip, for the time I have available. My friend Johanna will be pleased to see that the local Starbucks puts out a doggie watering dish. Johanna helped found McDog. I can't recall ever being in a beauty parlor before but I must say this one is a real blast from the past! My mother-in-law has been going here for years and years. It is quite remarkable what women do. Myself, I have a clipper and the half inch attachment and just buzz my head now and then but no. Only a Beauty Parlor will do for a Lady! A few more touch ups and we are good to go. It made her day and I had an interesting experience! Hurry up and wait plus oddities. Changes in Latitude. Changes in Attitude. Health Care. Larger than life. The Olympics are out! The Olympics are out!